Here is a later Florida brand that I know little about. ONE STOP. I don't think they were around when I left Florida in 1966, so not sure when they started. I believe they were headquartered in the Jacksonville area, but I am not even sure of that. Seems like most of their sites were once something else, which is true of both of the photos above. TOP.......Barberville, Florida at the junction of US 17 & Florida 40. Nov. 19, 1984. This site went through a couple of brands, and when I was in college in DeLand it was a THRIFT station, but that building had been replaced long before this photo. BOTTOM........Bunnell, Florida, US 1 north. Sept. 14, 1985. 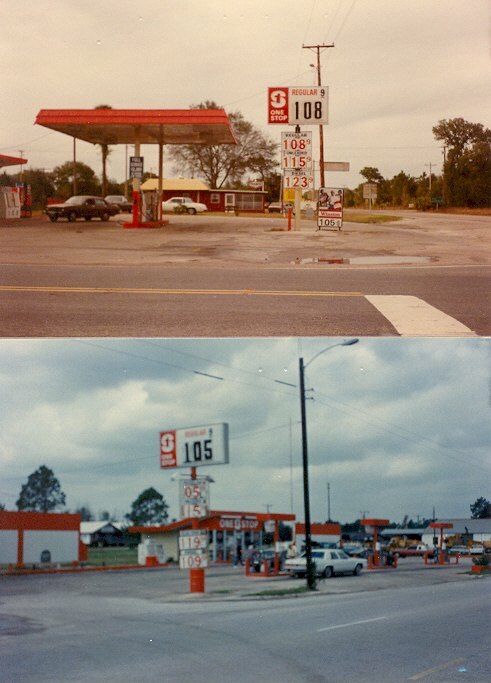 Before I-95 went in this town north of Daytona Beach had a lot of independent stations, COLONIAL, SHAMROCK, a SING dealer station and a SUPERTEST, which later became this ONE STOP. The photo is of poor quality as I had a whole roll from that trip that came out sort of "fuzzy" and out of focus..never figured out why. It rings in my mind that I saw a ONE STOP still operating in Jacksonville in 1995, but I am not sure on that. No know collectibles.